I turn left on the two-lane road leading to the town of Sedona. The world outside transforms into something much different than the one I am accustomed to. Towering red-rock Mountains appear unexpectedly. The striped hills are radically different from the ordinary-looking mesas overlooking the surrounding terrain. For the first time, the advertisements promoting this area ring true. I get the distinct impression there is something special here. There is suddenly hope the three thousand mile plane ride and the hotel suite awaiting my wife and I will prove to be a wise investment after all. Sedona is a spiritual spa for die-hard vacationers as well as world-weary travelers searching for a way to resurrect their lives from an assortment of disappointments and failures. I am not here to seek advice from healers, psychic or life counselors. I am here to discover the heart and soul of this city out of time without the help of a tour guide. Sedona is amazingly clean. There are no signs of litter in the streets or sidewalks, no unsightly garbage dumps to mar the town’s bright aura. The buildings, homes and streets all look brand new. Most of the architecture is a sort of southwest modern with earth tone colors alternating with pastels. It seems as though a beautiful, uniquely designed church abides on every street corner. No two homes look alike, yet no building seems out of place. There is an underlying unity of design but not at the expense of individuality. The single-story adobe-style homes at street level and the larger mansions in the mountains have no bars on their yawning windows. They all look expensive, probably worth hundreds of thousand dollars each upwards into the millions. Incredibly, you don’t see gates in front of the winding driveways. There are no traffic lights clogging the two-lane road running throughout the town. Instead, they have what the locals call “round-a-bouts.” Here, the visitor finds an honor system where vehicles yield to the one reaching the four-way intersection first. Anyone who doesn’t obey the code is sure to be a tourist. I spend most of my time here in art galleries and walking around slack jawed, agape at the rock formations, multi-colored mountains, and fiery sunsets. I feel “buzzed” every waking moment. Even shopping, which I normally hate, feels like an acid trip. The town itself, I think, is one huge energy vortex. Young people flock here as if drawn to the area by the magnetic power of the town’s famous energy vortexes. Many of the transplants have fled small towns where they grew up throughout the west to taste big city life. After living in places like Houston, Phoenix, and Santa Fe, they search for something else. 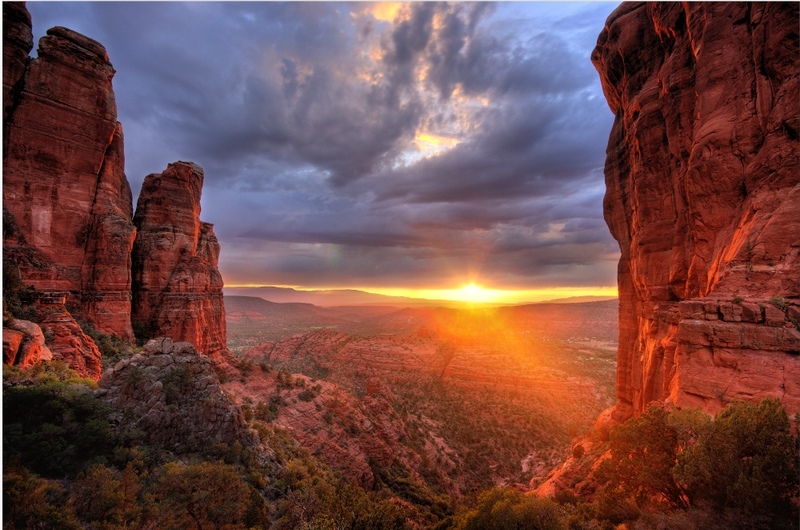 They find it in Sedona, where small city values couple with new vistas of financial and cultural opportunity. Everyone you meet here seems to be from somewhere else. Heaven is likely to be quite similar, come to think of it. This entry was posted on April 19, 2011, 2:41 pm and is filed under Essays, memories, musings, profiles, reflections, Uncategorized. You can follow any responses to this entry through RSS 2.0. You can leave a response, or trackback from your own site. Beautiful my friend! Thanks for visiting my blog!!!!! Thanks Wendell. I’m glad we connected. I look forward to reading your words of wisdom and inspiration. great analogy at the end.